Let me introduce myself first. I have been maintaining ham radio application under Linux for two decades, linfbb and FPAC. I am also contributing occasionally to Linux net modules AX25 and rose. I have a couple of raspberry pi with UDRC II hats running compass distro with Direwolf APRS and at the same time AX25 packet radio network applications. Everything is running flawlessly with last updates. I recently experienced kernel panics with compass Linux distro with kernel 4.14.79-v7+ as soon as opening a Chromium window. Kernel panic does not occur if I rmmod all snd and udrc modules before activating Chromium. After removing all sound and udrc module, modprobe udrc does not reload all needed modules for aplay - l to find udrc card. 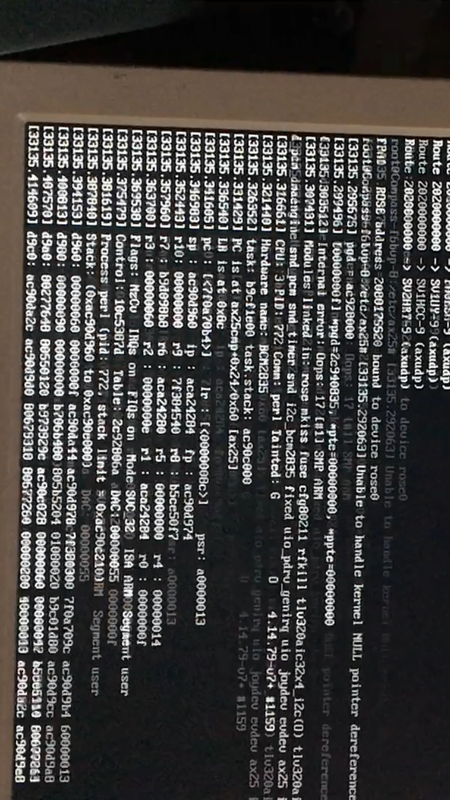 I attach one of the photo I took from screen while kernel panic. It shows a null pointer related to bcm2835. sdhost-bcm2835 3f202000.mmc could not get clk, deferring probe. udrc: loading out-of-tree module taints kernel. If you need I can send you more details and screen pictures. then you can show us more information from the panic. addresses one of which is null. rose0 but it's difficult to parse the screen shot you attached. problem and not a compass/udrc codec problem. applications. Everything is running flawlessly with last updates. Indeed the mapping fails a few times before it succeeds. This is because of driver dependency ordering. Many times the tlv320aic32x4 driver doesn’t look quickly enough for the other pieces of the sound driver. This is why the framework retries, because module dependencies aren’t always the greatest in Linux. shows a null pointer related to bcm2835. There’s no relation really to BCM2835. The BCM2835 is the Broadcom System on a Chip part number of the SoC on the Raspberry Pi. The Oops message is telling you that it’s running on a Raspberry Pi. It has no real relation to the cause of the panic. This is the Raspberry Pi’s MMC interface on the MMC. It’s just commenting that whatever clock it’s running isn’t ready yet, and it’ll load the driver later. This is a normal condition on the Pi during boot. This just means that we compiled the udrc kernel module “out of tree” instead of “in tree.” That means we don’t have the full Linux kernel source, just the necessary headers. It’s not a part of the kernel itself. This is a normal condition. I think Basil has a sound analysis here that you’re seeing a panic in the ax25 stack somewhere. I’d have to investigate what the changes to the ax25 stack were between kernel versions and try to bisect it. If you’d like to know my offhand guess as to what’s happening, I’d guess that Chromium is trying to do a broadcast to all interfaces for some reason. Once you load the ax25 stack, the packet modem becomes a network interface. This broadcast packet is probably triggering a bug in the ax25 stack due to it having some sort of freaky address (or more accurately no address) by the time it gets there. But this is just a wild guess from hearing the symptoms. Other than the fact it’s saying that the tlv320aic32x4 driver is loaded at the time of panic, there’s nothing here that really points to the udrc; just to the ax25 stack. You might want to poke at the kernel ax25 folks and they may be able to illuminate more. Or Basil grubs around in that chunk of the kernel more than I and may have some knowledge to illuminate the situation. If you?d like to know my offhand guess as to what?s happening, I?d guess that Chromium is trying to do a broadcast to all interfaces for some reason. Once you load the ax25 stack, the packet modem becomes a network interface. This broadcast packet is probably triggering a bug in the ax25 stack due to it having some sort of freaky address (or more accurately no address) by the time it gets there. But this is just a wild guess from hearing the symptoms. Check Samba as well if it's loaded and running. It's a known contributor to "talk to all interfaces" problems. U.S. Weather Alerts: Firenet.aprs2.net, port 14580, filter "t/n e/WE7U-WX"
I would like to thank all who sent a reply to my kernel panic message. addresses one of which is null." he wrote. Chromium and rose unraveled the old bug, during tasks swap (?). I now have to convince netdev authority to accept the simple patch. systematically when opening Chromium the patch can be more easily accepted. rose module could be built, turning around "official" kernel distro. just a wild guess from hearing the symptoms. to "talk to all interfaces" problems. is just a wild guess from hearing the symptoms. contributor to "talk to all interfaces" problems.